Barbados is a parliamentary democracy with universal adult suffrage and a bicameral legislature and party system. Barbados is also a constitutional monarchy with Queen Elizabeth II as head of state. She is represented by a governor-general who is appointed on the recommendation of the prime minister. 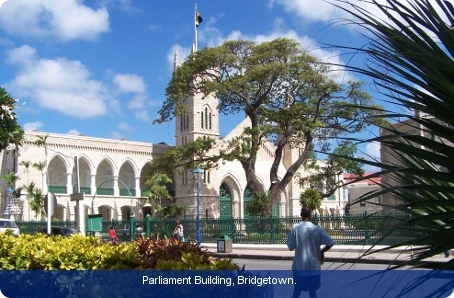 The parliament of Barbados consists of Queen Elizabeth II, the Senate and the House of Assembly. The Senate consists of 21 members appointed by the governor-general; 12 on the advice of the prime minister, two by the leader of the opposition and the remaining seven at the governor-general’s discretion. The House of Assembly has 30 directly elected members who sit for a period not exceeding five years. The governor-general, acting in accordance with the advice of the prime minister, can at any time prorogue or dissolve parliament. When parliament is dissolved, the governor-general is obliged to issue writs for a general election of members of the House of Assembly returnable within 90 days. The governor-general appoints as prime minister the parliamentarian who commands – in the governor-general’s view – the largest support within the House of Assembly. The prime minister heads the cabinet. Other ministers are appointed by the governor-general on the advice of the prime minister. The judicial system, based in broad terms on English Common Law, is administered by the Supreme Court of Judicature. This comprises the High Court and the Court of Appeal. Magistrates’ courts conduct preliminary hearings. The judges of the Supreme Court are the Chief Justice (appointed by the governor-general) and such number of puisne judges as prescribed by parliament. A judge may be removed from office only for inability to discharge the functions of his office or for misbehaviour. In 2005 the Caribbean Court of Justice in Port of Spain, Trinidad and Tobago, became the final court of appeal, replacing the Privy Council in the United Kingdom. The Caribbean island of Barbados has probably been inhabited for thousands of years, but it was not until the end of the fifteenth century that European explorers first became aware of the island. In 1625 it was formally claimed for King James I of England. It soon became an English settler colony which featured a sugar plantation economy, worked by slaves taken from Africa. By 1957 Barbados had virtual self-government and in 1966 it achieved independence from the United Kingdom. The Barbados Labour Party (BLP), which developed out of the trade unions, gained a majority in the House of Assembly between 1944 and 1961. In 1955 a split in the BLP led to the formation of the Democratic Labour Party (DLP). In the decades after 1966, the BLP and DLP alternated repeatedly as party of government and party of opposition. In 1989 some dissidents within the DLP broke away to form a new National Democratic Party (NDP), but failed to win any seats in the 1991 elections. In 2006 the People’s Empowerment Party (PEP) was formed. In 2008 the DLP won the general election, ending the BLP’s 13 years in government. The PEP did not manage to win any seats.